What is an important factor in determining the probable motion of dinosaurs? One of the most important factors in determining the probable motion of dinosaurs is their posture. Without an accurate knowledge of the animals’ postures, their motion—whether obtained through the use of homologies, analogies, trackways, or a combination of these—can be misleading or downright wrong. From the evidence of footprints, dinosaurs had an erect (or upright) posture, with their limbs directly under their bodies. This structure resulted in a motion similar to modern mammals, with the limbs held out to the sides and the upper bones nearly parallel to the ground. Surprisingly, this posture was more similar to modern mammals than lizards, which have a sprawling posture. But there were also variations within this erect posture, leading to some very unique movements. Some dinosaurs were bipedal, walking only on their hind limbs; others were quadrupeds, walking on all four limbs. Other dinosaurs spent most of their time on all fours, but were capable of standing on their hind limbs. Still others reversed this action, spending most of their time on two hind limbs, but capable of moving on all fours. In the end, each had a distinct motion and behavior based on its respective posture. 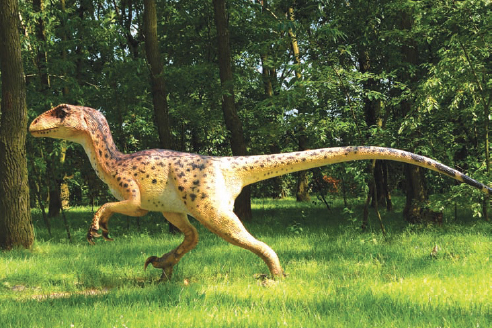 By analyzing anatomy and footprint fossils, and by drawing comparisons with today’s animals, scientists have made various hypotheses on how dinosaurs like this Deinonychus antirrhopus may have moved (Big Stock Photo).